It’s hard to remember she’s a few weeks shy of 26. She barely looks a day over 20 and her music soars with the sophistication and inventiveness of at least two additional decades. 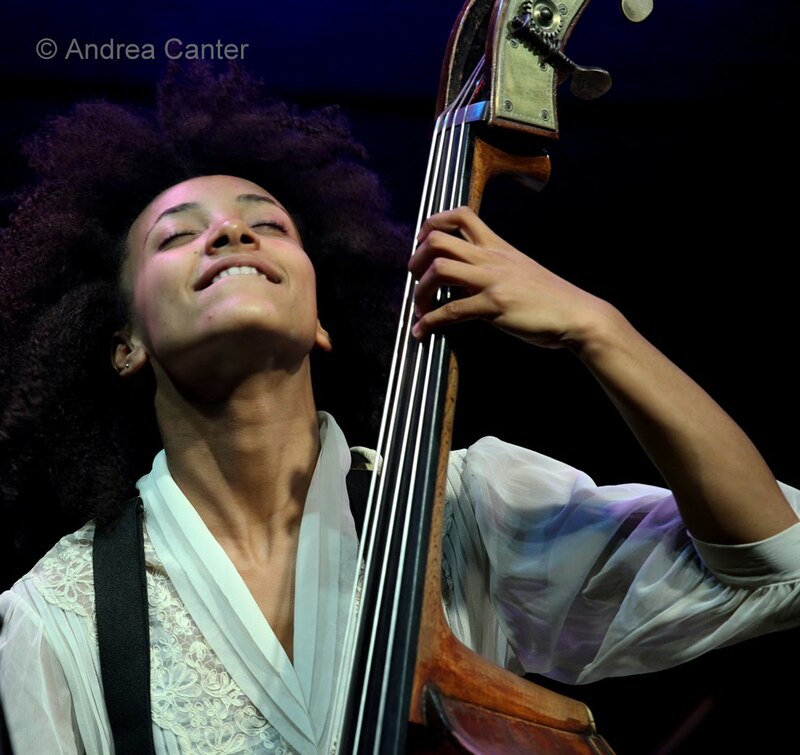 She dropped out of high school, dropped in to Berklee, and by 20 was their youngest faculty member. 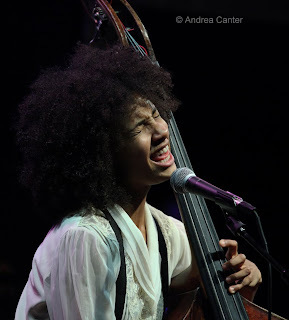 If you are looking for a modern definition of artistic genius, look no farther than bassist/vocalist/composer/bandleader/educator Esperanza Spalding. And look at your calendar, because you have one more night (tonight!) to catch her at the Dakota Jazz Club. In 2008, Esperanza released a highly praised American debut recording. She made her first appearance at the Dakota in spring 2009, returning a few months later to headline the Twin Cities Jazz Festival (the other headliner was Allan Toussaint). Since then, in addition to a long list of guest appearances at such gatherings as the White House and Nobel Peace Prize concert, she’s launched a new “Chamber Music Society” project that injects a classical string ensemble and additional voices into her jazz trio. 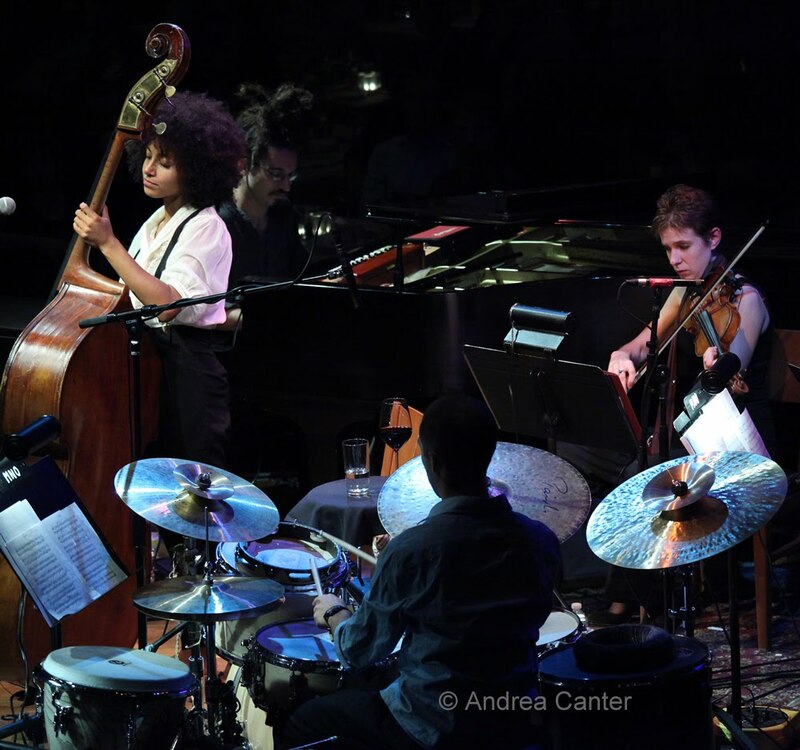 Her recent CD reflects the original compositions and arrangements written for the Chamber Music Society, music that she brings along on her fall tour with her entourage of musicians and crew. And it’s an entourage fit for a rock star, which she may yet become. Mostly they travel by bus—cheaper for a large group, more comfortable and reliable. And it allows more props. Which is an important feature because this is not just a music gig, this is theater. Good theater. Her first set opens to a dark stage, the voice of Dakota owner Lowell Picket thundering his “upcoming events” from somewhere above rather than his usual greetings from the stage. Then a moment of silence as the small figure emerges in the darkness, making her way to a comfy chair in front of the stage. She flicks on the small lamp,removes her trench coat, shrinks into the chair, gathers her wits, reaches for the adjacent bottle of wine and pours. Like anyone coming home from a hard day at work. Time to relax. Soon, Esperanza is on stage, grabs her upright bass, and the lights come on. Her string trio, pianist (Leo Genovese) and drummer (Richie Barshay) are in place. And for the next hour+, we are witness to an orchestral suite, its own one-act play where the musicians rely on what seems to be a skeletal script that allows for considerable interaction among the artists as they write and rewrite their variations on compositions that come largely from Chamber Music Society. There’s no chatting with the audience or announcing tunes. Yet we sense we are a critical component of the experience. What’s art without response? 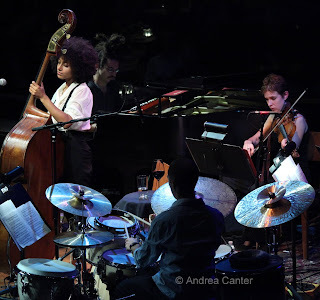 They open with her “Little Fly” (setting the words of William Blake's poem), Spalding’s high pitched soprano voice gently sparring with her own low basslines, blending with the violin/viola/cello and (vocally) suggesting some of Gretchan Parlato’s recent work… but Gretchen sticks to one instrument. Esperanza balances two for most of the set. Each segment moves seamlessly (save applause) into the next. Is it all from Chamber Music Society? Maybe. By the time she gets to her arrangement of the Tiomkin/Washington “Wild Is the Wind,” we are mesmerized, by the music, the drama, the originality of the arrangements, the blend of high strings, high voice, bottomless basslines. The formal part of the suite ends as it began, lights dimmed, Esperanza settling briefly in the easy chair, putting on her trench coat, turning out the light. But there’s a curtain call. “Midnight Sun” (Lionel Hampton/Johnny Mercer), a solo encore, really steals the show after the fact. Two-instrument “solos” are challenging enough when it’s piano and voice, guitar and voice. Bass and voice have a special challenge, at least with Esperanza’s arrangement. Unaccompanied voice requires perfect intonation, but voice accompanied by bass improvisation? Not only is there no melodic anchor for voice, there is a competing rhythm and melody. And if Esperanza finds it challenging, she gives us no hint. Her high-range vocal blues sounds oddly beautiful against the bottom tones from her percussive bass, and her interpretation takes advantage of both, bringing complementary notes close together while opening pungent spaces. Not that the rest of the cast was superfluous, but the night would have been completely satisfying and long-remembered had it been limited to that hypnotizing epilogue.